Our Adam Kadmon Elixer is called Antimony. The Set includes Purificato (AM Formula) and Crystalis (PM Formula). A Homeopathic formulation critical to the Adam Kadmon activation.Ancient Alchemists searched for the formula for Antimony, and we believe we have found it! Antimony was said to be the elixir of life, or Philosopher’s Stone. Paracelsus, a 15th century Alchemist, was said to have created Antimony. In legend, Antimony was supposed to mark a new beginning for the Individual – setting them on a road to health and happiness. � This incredible product is considered a beauty product, used to clean the skin and environment. � Antimony is a vibrational rememdy developed to enhanced to support your Spiritual Evolution and the 24 Strand (Adam Kadmon) DNA Activation. 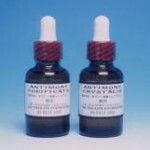 � Antimony is Vibropathic, made from pure distilled water. � Antimony works at the vibration/ energetic level according to the law of similars. Whether the legends about Antimony are true or not – we leave up to you to determine. We make no medical claims for Antimony, or claims as to effects on you. 30 DAY REFUND POLICY If you don’t like the product for any reason return it within 30 days for a full refund! Antimony, Adam Kadmon, and 24 Strand DNA Activation are Registered Trademarks of Triolite, Inc. Antimony is available to everyone and you will find it products website at retail prices. Antimony is sold wholesale to Certified 24 Strand DNA Activators. The minimum wholesale order is 10 sets. Handmade 24 Strand DNA Activation and Etheric Surgery Wand, created for you by Ben Hogan a Shaman and Initiate. The Wand features a specially charge DNA Activation and Etheric Surgery Crystal, Sage handle, covered with leather. The wand is decorated with beads and is a true tool of light! The crystals have been specially charged and prepared for a year before they are mounted on the sacred sage.